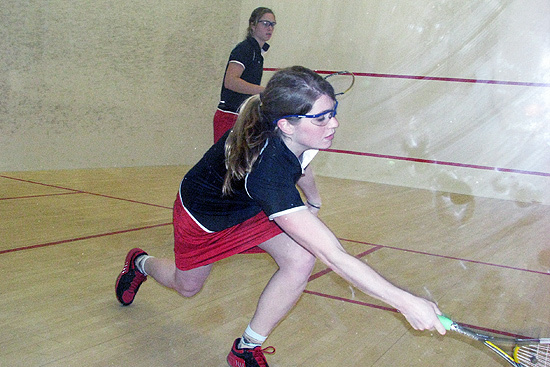 Above, Liz Demakos ’09 of Amherst, N.Y. was named a New England Small College Athletic Conference All-Academic selection for Women’s Squash. Below, Sean Watson ’08, was named an All-Academic for Men’s Indoor Track and Field. The New England Small College Athletic Conference announced its 2007-08 Winter All-Academic selections March 19 with 407 student-athletes that participated in a winter sport earning All-Academic recognition. To be honored, a student-athlete must have reached junior academic standing and be a varsity letter winner with a cumulative grade point average of at least 3.35. A transfer student must have completed one year of study at the institution. Jonah Blumstein ’09, Men’s Indoor Track and Field, Scarsdale, N.Y.
Lila Bolke ’08, Women’s Ice Hockey, Minnetonka, Minn.
Julia Cohen ’09, Women’s Ice Hockey, Washington, D.C.
Scott Cole ’09, Men’s Indoor Track and Field, Newton, Mass. Lauren Cruz ’09, Women’s Swimming and Diving, Forest Hills, N.Y.
Liz Demakos ’09, Women’s Squash, Amherst, N.Y.
J.Z. Golden ’08, Men’s Squash, Merion, Pa.
Sam Grover ’08, Men’s Indoor Track and Field, Williston, Vt.
Tameir Holder ’08, Women’s Indoor Track and Field, Lakeview, N.Y.
Hannah Jackson ’09, Women’s Ice Hockey, Brookline, Mass. Agnes Koczo ’09, Women’s Swimming and Diving, Suffern, N.Y.
Derek Kuwahara ’09, Men’s Indoor Track and Field, Torrance, Calif.
Anwell Lanfranco ’08, Men’s Indoor Track and Field, Salem, N.H.
Shannah Lively ’09, Women’s Basketball, Royalston, Mass. Meredith Lowe ’09, Women’s Basketball, Philadelphia, Pa.
Nikki Maletta ’08, Women’s Basketball, Durham, Conn.
Benjie Messenger-Barnes ’09, Men’s Squash, New York, N.Y.
Stephanie O’Brien ’08, Women’s Indoor Track and Field, Newton, Mass. Mike Pepi ’08, Men’s Swimming and Diving, Huntington, N.Y.
Jon Sargent ’09, Men’s Basketball, Ashburnham, Mass. Alex Shklyarevsky ’08, Men’s Ice Hockey, San Jose, Calif.
Jeff Stein ’08, Men’s Swimming and Diving, Glencoe, Ill.
Ashley Un ’09, Women’s Swimming and Diving, Swarthmore, Pa.
Sean Watson ’08, Men’s Indoor Track and Field, Manhattan Beach, Calif.
Brent Winship ’09, Men’s Ice Hockey, Manhattan Beach, Calif.
More information on the 2008 winters is online at http://www.nescac.com/honors/allacademic/academic07-08-winter. The NESCAC announced its 2007 Fall All-Academic selections Nov. 17 with 332 student-athletes that participated in a fall sport earning All-Academic recognition. Sam Blank, ’09, Women’s Soccer, Chicago, Ill.
Jonah Blumstein ’09, Men’s Cross Country, Scarsdale, N.Y.
Lisa Drennan ’09, Volleyball, Ann Arbor, Mich.
Gavi Elkind, ’09, Women’s Soccer, San Francisco, Calif.
Becca Feiden ’08, Women’s Soccer, Takoma Park, Md. Laura Fine ’08, Women’s Soccer, Seattle, Wash.
Nicole Gray ’08, Women’s Soccer, Silver Spring, Md. Jamie Hiteshew ’08, Men’s Soccer, Montclair, N.J.
Zach Librizzi ’08, Football, Essex Junction, Vt.
Becky Malik ’09, Women’s Soccer, Warren, N.J.
Justin Mello ’08, Men’s Soccer, Rehoboth, Mass. Tim O’Callaghan ’08, Football, Babylon, N.Y.
Molly O’Connell ’09, Field Hockey, Brookline, Mass. Sarah Orkin ’09, Women’s Soccer, West Hartford, Conn.
Ozzie Parente ’09, Men’s Soccer, Orange, Conn.
Lucia Pier ’08, Women’s Cross Country, Sonoma, Calif.
Becca Rodger ’08, Volleyball, Long Beach, N.Y.
Maddie Rottman ’08, Field Hockey, Exeter, N.H.
Hailey Sarage ’09, Field Hockey, Springfield, Mass. Anna Schindler ’09, Women’s Cross Country, Newton, Mass. 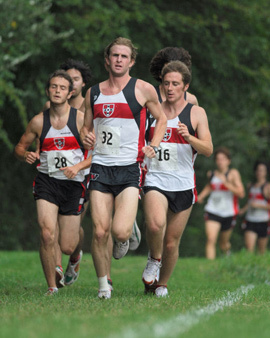 David Tassone ’08, Men’s Cross Country, Arlington, Mass. Dave Velardo ’08, Men’s Golf, Wilmington, Mass. Sean Watson ’08, Men’s Cross Country, Manhattan Beach, Calif.
Liz Wheatley ’09, Women’s Cross Country, Arlington, Mass. Tory Whitney ’08, Field Hockey, Brookline, Mass. Tyler Whitley ’08, Football, Torrington, Conn.
Anna Williams ’09, Volleyball, Northfield, Minn.
Jettie Word ’08, Volleyball, Albuquerque, N.M. Founded in 1971, the New England Small College Athletic Conference (NESCAC) consists of 11 liberal arts colleges and has consistently reflected its commitment to the values of athletics and academic achievement. The member colleges of the conference are Amherst College, Bates College, Bowdoin College, Colby College, Connecticut College, Hamilton College, Middlebury College, Trinity College, Tufts University, Wesleyan University and Williams College. More information on the fall is online at http://www.nescac.com/honors/allacademic/academic07-08-fall. Squash photo by Brian Katten ’79, sports information director. Cross country photo by Steve McLaughlin.